(Newser) – What the St. Louis Cardinals did to the Washington Nationals last night has Ryan Bothmann at Bleacher Report wondering whether this might be the "most clutch" team in sports history. 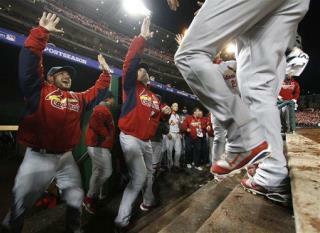 If you missed it, the Cards once trailed 6-0 in the game but scored four in the bottom of the 9th to win 9-7. They were down to their final strike more than once and came through, just as they did again and again last year on the run to the World Series title. Yogi Berra said it first: "It ain't over till it's over." The Giants overcame a 2-0 deficit on the road, also clutch. Going to be a great NLCS with the last two World Series champs playing.